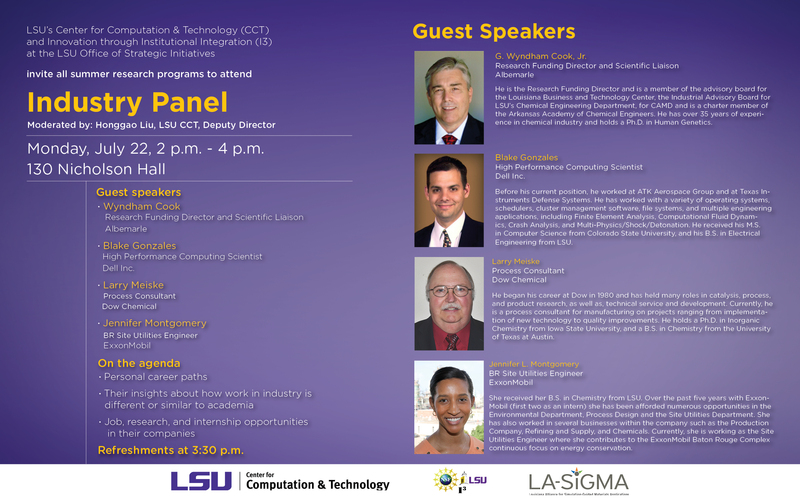 I’ve been invited to represent Dell and speak at LSU’s upcoming HPC Industry Panel. It’s exciting to go back to my alma mater! Students from across LSU’s summer research programs will be in attendance. It’s just too bad this didn’t happen a month later so I could catch an LSU football game in Death Valley! At least I will get a chance to see SuperMike-II which I had a considerable role in designing. “I decided to co-op in college, and it was the best decision I ever made,” said Blake Gonzales, high performance computing scientist at Dell Inc. “What you can actually do will make the world of difference, not your GPA or where you went to school,” he added. “I had a low GPA at one point as an undergraduate student, but received 13 job offers. So if you don’t have a job yet, walk out of this room after our meeting and find one!” he said. “Learning is very important for me, too, and while designing supercomputers at Dell, I spend a lot of time reading and writing papers,” said Gonzales. When talking about job opportunities at Dell, Gonzales pointed out that there are many open positions in the area of high performance computing (HPC). “HPC is infiltrating every part of society, every manufacturing process, every biological process, and it is becoming a very exciting field to work in,” he said. Gonzales mentioned a project recently implemented by Dell that involved the top cancer that strikes children. After the little patients are diagnosed, it takes several weeks to start treatment, because doctors first must complete DNA sequencing that requires a lot of computation. Dell’s specialists in HPC were able to cut down the time from several weeks to four hours. This can literally save lives, as children will be getting their treatment sooner now.